Classic Car Photography is very proud that our images were chosen to form the basis of the Goodyear Autocare Calendar for 2014. We are particularly proud of the image for July 2014 –a classic Ford Thunderbird muscle car. The Ford Thunderbird began life in February 1953 in direct response to Chevrolet’s new sports car, the Corvette, which was publicly unveiled in prototype form just a month before. Under rapid development, the Thunderbird went from idea to prototype in about a year, being unveiled to the public at the Detroit Auto Show on February 20, 1954. Like the Corvette, the Thunderbird had a two-seat coupe/convertible layout. Production of the Thunderbird began later on in September 1954 with the car beginning sales as a 1955 model in October 1954. Though sharing some design characteristics with other Fords of the time, such as single, circular headlamps and tail lamps and modest tailfins, the Ford Thunderbird was sleeker and more athletic in shape, and had features like a faux hood scoop and a 150 mph (240 km/h) speedometer hinting a higher performance nature that other Fords didn’t possess. Mechanically though, the Thunderbird could trace its roots to other mainstream Fords. The Thunderbird’s 102.0 inch (2,591 mm) wheelbase frame was mostly a shortened version of that used in other Fords while the car’s standard 292ci (4.8L) V8 came from Ford’s Mercury division. The Thunderbird sold exceptionally well in its first year. In fact, the Thunderbird outsold the Corvette by more than 23-to-one for 1955 with 16,155 Thunderbirds sold against 700 Corvettes. With the Thunderbird considered a success, few changes were made to the car for 1956. The most notable change was moving the spare tyre to a continental-style rear bumper in order to make more storage room in the boot, and an optional porthole in the removable roof was offered and often selected by buyers. However, the addition of the weight at the rear caused steering issues. The spare was moved back to the boot in 1957 when the boot was restyled and made slightly larger. Among the few other changes were new paint colours, the addition of circular porthole windows as standard in the fiberglass roof to improve rearward visibility, and a 312 ci (5.1 L) Y-block V8 making 215 horsepower (160 kW) when mated to a 3-speed manual transmission or 225 horsepower (168 kW) when mated to a Ford-O-Matic 2-speed automatic transmission. 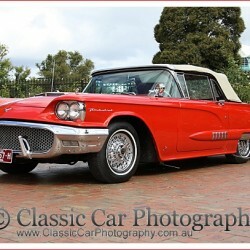 The Thunderbird was revised for 1957 with a reshaped front bumper, a larger grille and tailfins, and larger tail lamps. The 312 ci (5.1 L) V8 became the Thunderbird’s standard engine, and now produced 245 horsepower (183 kW). Other, even more powerful versions of the V8 were available including one with two four-barrel Holley carburettors and another with a Paxton supercharger delivering 300 horsepower (220 kW). Though Ford was pleased to see sales of the Thunderbird rise to a record-breaking 21,380 units for 1957, company executives felt the car could do even better, leading to a substantial redesign of the car for 1958. Although the first generation Thunderbird had been considered a rousing success, Ford executives felt that the car’s position as a two-seater restricted its sales potential. As a result, the car was redesigned as a four-seater for 1958. Though retaining a design as a two-door hardtop coupe/convertible, the new Thunderbird was considerably larger than the previous generation, with a longer 113.0 inches (2,870 mm) wheelbase to accommodate the new back seat. The increased size also increased the car’s weight significantly by close to 1,000 pounds (454 kg). Along with a new, more rigid unibody construction was new styling, including dual headlights (for a total of four), more prominent tailfins, a bolder chrome grille, and a larger, though non-functional, hood scoop. Powering the Ford Thunderbird was a new, 300 horsepower (220 kW) 352 ci (5.8 L) V8, available with a 3-speed manual or automatic transmissions. With 37,892 sold in 1958—outselling the previous model year by well over 16,000 units—the new Thunderbird began a sales momentum previously unseen with the car. With little more than a new grille and a newly optional, 350 horsepower (260 kW) 430 ci (7.0 L) V8 for 1959, sales climbed even higher to 67,456. For 1960, the Thunderbird was given another new grille and other minor stylistic changes along with a newly optional manually operated sunroof for hardtop models. Dual-unit round taillights from 1958 to 1959 were changed to triple-units after the fashion of the Chevrolet Impala. Customers continued to approve of the car as it broke sales records yet again with 92,843 sold for 1960. In spite of this success, Ford went ahead with a redesign for the Thunderbird to debut in 1961. (Above history based on Wikipedia and other sources). All images are available for purchase as high quality photographic prints or as digital download. Prices start at $10 for a digital download and from $15 for an 8” x 12” print (plus postage).